It is 6 A.M. on a Wednesday, and I am sixteen years old. I park my 1952 Chevy outside the back door of the Oroville Mercury Register to deliver my news story and a roll of film to Byron Boots, the newspaper’s sports editor. As I enter the newsroom, the sound of typewriters clicking away and that unique blended smell of coffee and printer’s ink lifts me out of my life as a highschooler and into the larger world of the journalist. One of the easiest ways to break into print is by publishing in your local newspaper. At a time when many larger newspapers are being successfully challenged by the internet, local newspapers are still an area’s repository of information about all things local: clubs, church news, sports, school events, Little League, local color (whose hog got the blue ribbon at the fair)—you name it. The local newspaper lives on as it always has—barely surviving—but nonetheless surviving because folks are willing to pay to read about their kid or their hobby club. They can’t wait to read Susie Local’s column on the social events of the week. And, luckily for the aspiring writer, there is always more of this kind of news than there are reporters. My high school “beat” as a reporter was my school’s tennis team. I gathered the stats, interviewed the coach and players, took photos with a 35mm camera the sports editor located for me in the local pawn shop (Byron talked the price down from $25 to $22.50), and I wrote the stories and got the byline. I also went fishing with Byron, and photos of me appeared regularly in his column. While fishing, Byron taught me how to chew tobacco but didn’t seem too disappointed when I promptly taught myself to quit. The only fun part was the spitting, anyway. I would like to find a way for more of my students to experience the joy of having a byline. There’s a special joy when you see your name in print, designating that you are the writer that wrote the story. Also, publishing in a newspaper is an authentic experience. Newspapers are businesses that make money, and in order for the paper to survive, a professional level of writing must be maintained. Even student writers, “cub reporters,” have to maintain that standard. 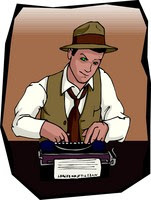 Try writing your own press release for an upcoming event or for an event that has already happened. Snap a photo and bring the jpeg. Submit to your local newspaper and ask for a byline. Just be sure to get the names spelled right. People are picky about that.